Have you been wondering how to dress for a job interview? Have the rules changed in recent years, and if so, what are they now? If you’re nervous for an interview, the last thing you want to be worrying about is what you’re going to wear. And yet, most people do. When you’re in the midst of submitting job applications, or attending interviews, figuring out how to ‘dress the part’ becomes a huge stress, sometimes more than the interview itself. Check out If You're a Student, These Are the Interview Tips You Need to Know. It’s true that there’s a lot more to an interview outfit than meets the eye. You need to gauge the tone of the workplace you’re looking to enter – is it creative, corporate or casual? Then you need to consider honouring your personal style, prioritising comfort while looking the best and most appropriate. It’s okay, though, Skillstalk is here to help. Attending an interview, it’s important you’re remembered for the right reason. You do not want to be remembered by the way you smell – whether that’s for bad body odour or a strong perfume or cologne. A lot of people are sensitive to scents and deodorants, so go easy on the application pre-interview. Have a look at 8 Common Interview Questions & How to Answer Them for more information. Dressing for an interview is a balancing act. While you want to look great, your outfit mustn’t distract from what you have to say. And you don’t want an interviewer to form a strong opinion about you before you’ve even had a chance to speak. It’s not being disingenuous to tone down or moderate your personal style for an interview, it’s just minimising possible distractions from your awesome responses to interview questions. Avoid wearing clothing with brand names or logos and t-shirts with slogans or jokes on them (you never know who you might offend). Keep the outfit straightforward and simple. Use your management skills to help you out. Most people fret about how formal their outfit should be. A big fear is being over or under dressed. You can do some snooping to figure this out. Jump on LinkedIn and see if you can find the profiles of your potential co-workers. Survey what kind of outfits they wear in their display pictures, and if you can find any photos of office functions. Your outfit should be chosen to blend in with the dress code of the team you’re applying to join. This doesn’t always mean you need to find something formal. In tech and creative industries, formal dress codes have all but been abolished. Sneakers, t-shirts and jeans have well and truly entered the office. That being said, some industries are showing no signs of backing off suits, ties and leather shoes. If you’re interviewing for a position in law, economics, finance, government or similar, stick with a conventional, formal outfit. Colours like navy, black and grey are common here, as are suits, skirts, sensible shoes (with a low heel if you want to add some height). 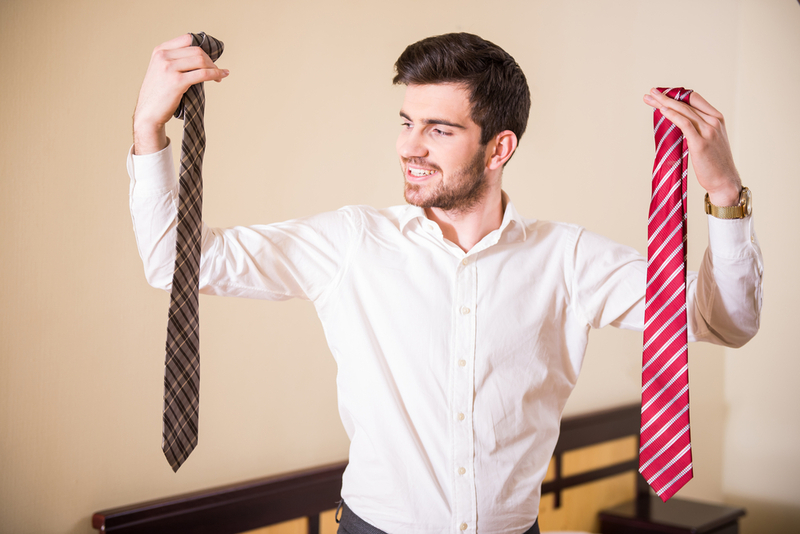 In corporate environments where the dress code makes it harder to stand out, some job applicants choose a distinctive tie or a blouse with a print like polka dots (nothing too loud) to be remembered by the selection panel. If the job involves meeting with clients or representing the business in public, a rule of thumb is that you need to look a bit more professional than someone who is behind the scenes. These golden rules apply no matter where you’re interviewing. You have to feel comfortable in the clothes you’re wearing, otherwise they’ll become a distraction that might undermine your focus during the interview. Avoid a waistband that digs in, anything that’s hard to sit down in, shoes that hurt your feet or make it difficult to walk and tight blazers that restrict your movement. Tidy means attention to detail. Go to the trouble of ironing your clothes, make sure they don’t have holes, loose threads, and definitely no stains. Shopping for second hand interview clothing is a really great idea, you can find some excellent workwear really cheaply in op shops and second-hand consignment stores, but examine it very closely before you buy it. If you’re wearing leather shoes, give them a shine. Keep your hairstyle minimal and simple. “Regardless of the job, I always make sure I have my hair out of my face, up or back in some way. Nothing is more distracting than a candidate who is messing with their hair! A neat side braid, low bun, or sleek pony will do the trick,” writes Jenna Rennert, Vogue.com Associate Beauty Editor. Once you’ve established what kind of outfit you need to prepare, whether it’s formal or smart casual, scour the wardrobe and see what you’ve got. If you can’t find what you’re looking for, don’t rush out and buy a whole bag of new clothes. Instead ask friends and relatives who are a similar size to you whether they have anything you can borrow. If you get the job you might need to invest in a few more pieces to wear to work, but until that happens don’t spend too much money on your work clothes. Have a look in local second-hand stores. When shopping second hand, read the label. See what fabric the item is made of. For a suit, natural fibres like wool are nicer than cheap synthetics which tend to look a bit shiny and cheap. Cotton and linen are good fabrics for shirts and blouses, they look good as well as breathing well, which discourages sweat patches. Consider having an interview outfit pre-prepared. Most of the jobs you’re applying for will fall within the same industry, so you can probably recycle the outfit, or make slight adjustments depending on the circumstances. Once you have a go-to outfit, you don’t need to waste the time or mental energy worrying about it again! In fact, the best time to sort out an interview outfit might be before you’ve even applied for a job. Watch this short video from Upskilled on how to answer the top 8 interview questions you’re likely to get. Good luck, and remember that the right job for you is out there; the more preparation you do now, the better you’re likely to go. Rosa Ritchie Rosa is a freelance writer based in Melbourne. She is passionate about the education sector and has been published in various online magazines. When she's not studying or writing, she's making coffee or hanging out with her dog.